LEARN HOW TO COMBAT ALLERGIES WITH HYPNOSIS!!! 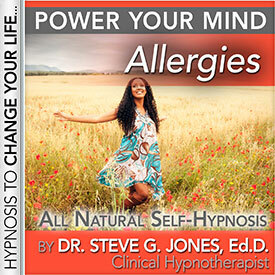 This NEW powerful self hypnosis CD and MP3 will give you the help you need to finally overcome allergies!!! Did you realize that allergies affect nearly 20% of Americans? That's 60 million people! Whether it is an allergy to food, prescription medication, or pollen, allergies are no fun. Common symptoms of allergies include sneezing, itchy eyes, running nose, skin rash, breathing difficulty, and even vomiting. This time of year can be particularly bad for people who suffer from airborne particles such as grass pollen, tree pollen, weed pollen, and mold. Seasonal allergies can vary depending on where you live and what time during the season it is. It's important that you do something about it if you suffer from allergies. If left untreated, allergies can lead to hay fever and other sinus problems such as sinusitis. If you are looking for a natural approach to relieving your allergies, perhaps you will give hypnosis a try. You don't need to live another day with your sneezing, running nose, and itchy eyes.